This weekend Massachusetts Senator Elizabeth Warren made her first trip to Iowa in the “exploratory” phase of her presidential campaign, emphasizing an economic platform she says will revive the middle class. Warren drew overflow crowds in Council Bluffs, Sioux City, Storm Lake and central Iowa. Warren drew extended cheers for that reference to the way the Senate’s Republican leader characterized Warren’s objections to President Trump’s first attorney general. Warren rarely mentioned Trump’s name this weekend, however. 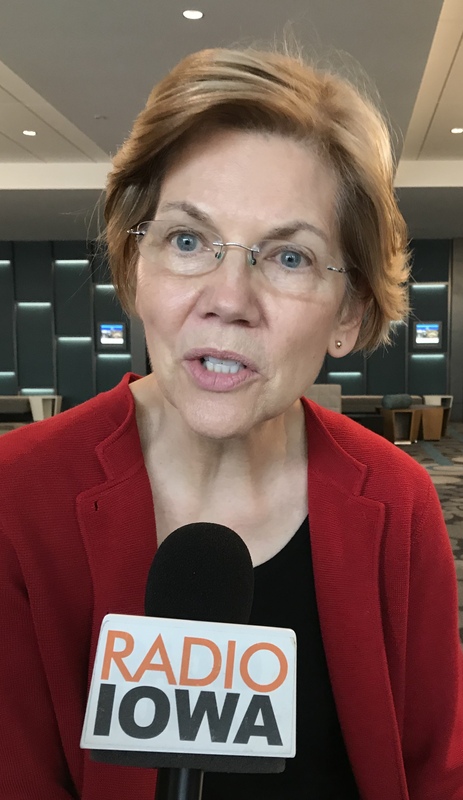 During an interview with Radio Iowa Sunday, Warren said it was time to end the war in Afghanistan, create a new public health insurance option and raise the minimum wage. Billionaires Michael Bloomberg and Tom Steyer have traveled to Iowa, too, and might compete against Warren for the Democratic Party’s 2020 presidential nomination. Warren said the election “shouldn’t be for sale” to wealthy people who can write checks to a “super PAC” or who can spend millions on their own campaign. 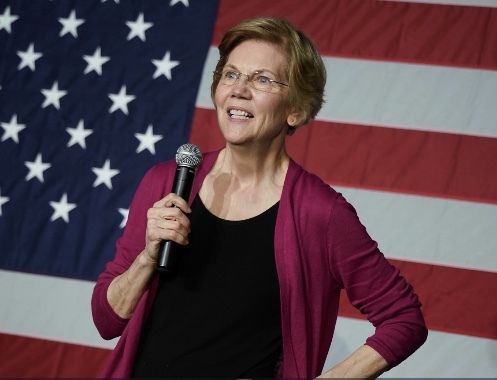 Warren was not among the presidential prospects who visited Iowa before the 2018 election, but Warren announced on New Year’s Eve she had hired staff to start organizing for the Iowa Caucuses. 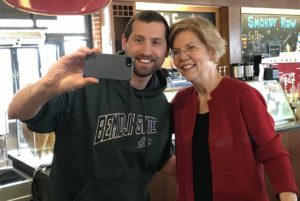 Warren spoke to big audiences this weekend, met privately with key Iowa Democratic Party activists and made an unannounced visit to a Des Moines coffee shop that’s a frequent stop for presidential candidates. Des Moines native Sam Billingsley was standing in line to order when Warren walked in. 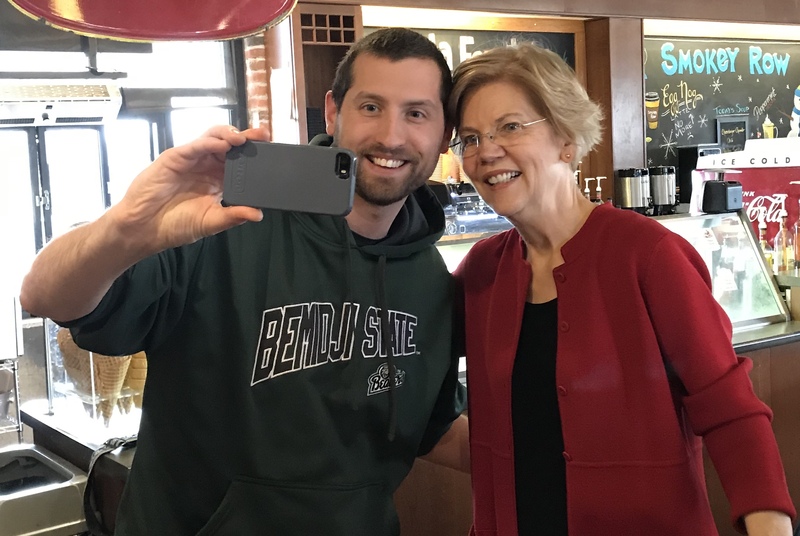 Nathan Svare of Des Moines meets a group of friends at Smokey Row Coffee Company every Sunday and, after meeting Warren, he asked for a selfie with the senator. Emily Shields, another Sunday morning Smokey Row patron, said Warren is off to an “impressive” start and that may influence others pondering a presidential run. “I think people are probably thinking they need to make a decision sooner rather than later because she’s getting the party started,” Shields said. The 2020 Iowa Caucuses are 393 days away.